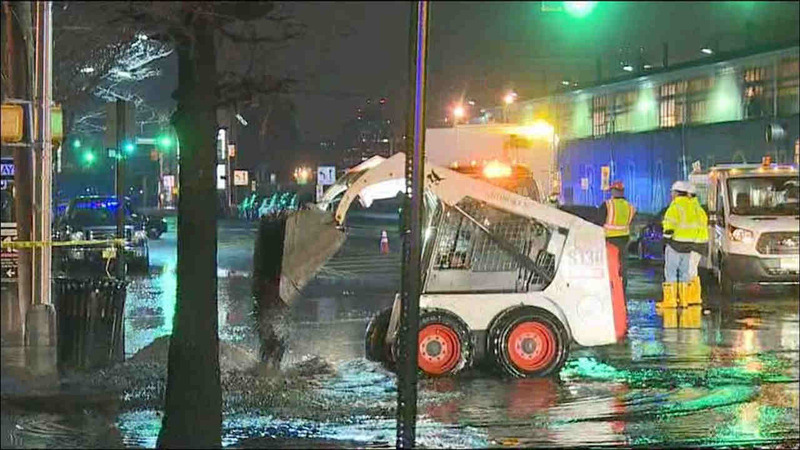 The cause of a water main break Wednesday morning in Hoboken is under investigation. HOBOKEN, New Jersey (WABC) -- A water main broke Wednesday morning in Hoboken, leaving streets flooded and many residents without water. The main ruptured near Observer Highway and Park Avenue just after 3:30 a.m., prompting the closure of a block of Park Avenue and Garden Street between Newark Street and Observer Highway. About 1,000 customers were without water to facilitate repairs, according to Suez Water, but workers isolated the main and restored service to all customers except for one building on Park Avenue. Observer Highway was closed from Park to Willow avenues but reopened around 7 a.m.
Hoboken Public Schools were open, but bottled water was provided for students and staff. The district said water pressure in the schools would be monitored throughout the day. There is no need to boil water, officials said.